This issue's article is written by Hagit Genosar - Chief Monkey at the Suwanee Math Monkey center in the USA. She gives a moving account of how a "non-math" person can end up loving math and teaching it with great success. The core computational project has been established by Dr. Brian Mc Enery to investigate the potential for using Vedic computational techniques in a modern computational environment.
" the development of a computational geometry package to explore the Real Space geometry proposed by Dr. S.K. Kapoor. The software developments for this project are being facilitated through the Pure language: a modern functional programming language, with symbolic computational capabilities and excellent connectivity to the domain of imperative computation through simple C based extensions. The wiki page at http://sourceforge.net/p/corecomp/wiki/Home/ provides an easy interface for those wishing to participate in, or merely keep track of, these developments. Fascinating article: "We report a series of experiments in which we show that multiple-word verbal expressions can be processed outside conscious awareness and that multistep, effortful arithmetic equations can be solved unconsciously." For an interesting article on applying Vedic methods to speed up computing time see: https://webspace.utexas.edu/hd3496/www/Downloads/DhiMit_IJMS2007.pdf. Agulto Rosendo Jr in the Philippine Islands was in our VMTTC-3 batch and is working hard to bring Vedic Maths to the children of this disadvantaged country. Progress in this direction is taking place and there is a very positive response from teachers and children. But conditions are quite adverse in schools and Rosendo needs funds to buy the equipment he needs to make the necessary impact and get Vedic Mathematics taught there. Any amount you can afford is most welcome. Rosendo has developed "Building Foundation" to assist with teaching in the schools and wants to make this available to us as well. Classes are by K. K. Kumaran who has been teaching a basic and advanced level course since 2006. This correspondence is from Amber in Australia who has been tutored by Vera Stevens. "My name is Amber Reid, I am 13 years of age and I am a year 8 student at the local state high school. In primary school I was an average student in reading and writing and was poor in mathematics. By class 6 my reading had improved, but maths was very difficult and I didn't understand the basics. I began having lessons with Vera at the beginning of year 7, one lesson every fortnight as my elder sister had a lesson with her on the alternate weeks. I came very willingly as I wanted to learn and the lessons were fun, easy and I soon saw that it all made sense. I worked with Pebble Maths until the basics were firm, about half way into year 7.I learned to see maths in pictures and so it all made sense. We then worked on high school material, and by the end of the year I had caught up so well that I was put into the top maths class (out of 5 classes) for year 8.
teacher gave us after which I understood all the class work without any help from Vera. There were only about 4 students in this position. Vera began to teach me more advanced Vedic maths and we also began to explore new work mainly to do with squaring and cubing. I discovered that I could square any two digit number in my head and also 'see' the square root of a perfect square. We then moved on to cubes and cube roots and they were easy too. When Vera and I are working on discovering new patterns she is sometimes faster than me but often I am faster than her. We never use a calculator. I find playing with numbers so fascinating and I am now a much better student, not only in maths but in my other subjects too. I would love to go to a school where they teach Vedic Maths but there aren't any here. I want to be a primary school teacher and teach young children maths in a fun way right from the start." My experience with Vedic Math! Let me start by saying, I have seen the great powers of learning and teaching Vedic Math to kids and adults, in the last 5 years. Take me for example: Math was not my thing. When graduating high school, I remember my friends asking: "what career are you going to pursue?" I had clearly stated "I am not sure, but I would certainly not be a teacher, definitely not a Math Teacher". It looked like the impossible. Funny enough I chose the path of accounting and graphic design. My high school Math teacher was strict and used to say; "You are either good or not good in Mathematics" (and I believed him), but boy I know now, he was so wrong! Even as a 3rd grader, I found learning my multiplication tables hard and boring. My mom even got me a private tutor. I thought something was wrong with me; I couldn't memorize all my facts. Today I know I can use "Nikhilam Multiplication" to solve it with ease and check my work (which I was not able to do before). Well, 20 years have passed, and my husband, decided to open a business. He heard about a special Math center for kids, where kids are running to a math class and they leave happy and smiling! He told me "That is interesting; I need to look into it". Even to him it sounded odd, how can it be fun? So we opened our own Math Monkey center in Atlanta area. Nothing could have prepared us for this phenomenon. I was not much involved in the beginning, but got curious to re-learn math in an easy way. Today, I am running the center and teaching classes, I love my job. 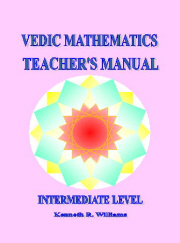 Vedic math has changed my life and my student's life. Parents tell us similar stories about their kids: Growing confidence, positive attitude, grades improvement, curiosity for learning, and almost immediate change in speed and accuracy. Some kids even come up with creative solving ways. The fear of math is GONE and if they are already advanced students, they are able to stay top of their class. When parents sign up for our program we tell them: There is only one risk you are taking here: "Your child will get smarter than their teacher"… We always get wide SMILES! Whenever we go to events, we share the love and ease of Mathematics the Vedic way. For me, it's important to show people there is a better way; the system is more fun than traditional ways. We often hear: "I wish I had known that when I was at school" My answer is always: "I wish I knew it too". People find it interesting and 95% of the time, ask us to show them more. Even if they admit they hate math. The beauty is: Vedic Maths is the best mental method and anyone (smart or not) can learn it! We are never too old to learn; knowledge is the most powerful thing in the world! Math Monkey of Suwanee USA. Issue 91 - How 'Vedic' is vedic Mathematics?